Chris White, Head of UK Equities and co-manager of the Premier Optimum Income Fund, and Geoff Kirk, co-manager of the Premier Optimum Income Fund, discuss key objectives of the Fund, selecting stocks, determining stocks to sell, how they expect the stocks to behave in different market conditions and their outlook on dividends within the UK. MIKE HAMMOND: Hello. My name’s Mike Hammond, Sales Director at Premier Asset Management, and I’m joined today by Chris White and Geoff Kirk, Co-Managers of the Premier Optimum Income Fund. Geoff, can we start with you initially, can you outline the key objectives of the Premier Optimum Income Fund? GEOFF KIRK: Sure, so the fund aims to deliver a distinctively high annual yield of 7% from an actively managed portfolio of UK equities, whilst also delivering the potential for long-term capital growth. MIKE HAMMOND: So given that you’ve got a target yield of 7%, which is obviously high, how is the yield generated? GEOFF KIRK: So the 7% is generated from two separate sources of income. Firstly, we receive the dividends from an actively managed portfolio of UK equities. This is currently around 4 to 4½%. We then top that up to the 7% target with option premium received from selling call options over selected shares in the equity portfolio. This has the effect of selling some but not all of the potential future upside on those stocks in exchange for an upfront cash premium that goes into the fund’s income account and could be paid out in the fund’s dividend. MIKE HAMMOND: So Chris, the equity portfolio as I understand it mirrors the Premier Income Funds, so what is the investment philosophy that underpins the equity portfolio? CHRIS WHITE: We are a genuine equity income fund. That is to say the portfolio is one of the higher yielding equity income funds in the market. We have a value and income philosophy. So we are very focused on valuation and what we pay for stocks when we invest in them. And we’re very focused on income. And that’s really for underlining fundamental of what we do, we’re providing a high income with income growth for our investors. We’re also a multi-cap fund. So we go where we see the value and the income in the market. If the value is in large cap stocks we’ll go there, if the value’s in mid cap stocks we go there, and if the value’s in small cap stocks we go there. But overall we like to be considered to be a core income fund rather than a specialist small cap income fund in the market. MIKE HAMMOND: So Chris, you’ve just talked about the philosophy behind the fund and the structure of the fund, so how do you go about selecting the underlying stocks within the portfolio? CHRIS WHITE: We like to buy quality companies or improving companies; that is to say companies that are going to become quality companies in the future. We have a core value philosophy rather than a deep value philosophy. So we want to buy quality companies on cheap valuations rather than weaker franchises when they’re a little bit down and out. We like to consider upside potential and downside risk when it comes to individual investments. So we like to invest in quality franchises, whether that be in goods or services. We like to invest with strong management teams; that is to say management teams that do what they say they’re going to do. And we like to invest in companies that have strong cashflow. We have very strong valuation disciplines but at the core of those valuation disciplines it’s the importance of a strong and growing cashflow. Because if you invest in those companies that have got strong and growing cashflows, then you’re likely to invest in companies that have strong and growing dividends. MIKE HAMMOND: Geoff, the underlying equity portfolio generates somewhere between 4 to 4½% of the yield. What is the process that you adopt to generate the additional yield to ensure that you meet the target yield of 7%? GEOFF KIRK: So the fund employs a simple covered call overwriting strategy. This involves selling call options over individual shares in the equity portfolio. A call option is a contract that gives the buyer of the option the right to purchase the stock from the fund at a pre-agreed price, called the strike price, at a pre-agreed point in time, the expiry date. Now if the share price is above the strike price on the expiry date of the option, that’s a situation where the buyer of the option would exercise that option; if the share price is above the strike price, then instead of actually physically delivering the stock, we will just pay the difference between the share price and the strike price to our option counterparty. Now in that case the fund will have missed out on the additional growth above the share price but we’ll have kept all of the share price growth up to the strike price, kept the option premium and kept the dividend that the stock pays. If the share price is below the strike price on expiry then there’s nothing for us to pay under the option contract and we keep all of any share price growth and again the option premium and the dividend that the stock pays. In exchange we receive this upfront option premium that goes into the fund’s income account. Now importantly we don’t sell all of the potential upside. We will always retain the first growth in the share price up to the strike price. Our objective is to sell just enough upside to generate the yield target but no more. We want to leave as much room as possible for capital growth. MIKE HAMMOND: And you talk there about the strike price and where that’s set; can you typically give some indication of where that strike price is set and therefore how much of the potential upside the fund retains? GEOFF KIRK: Sure, so strike prices will vary with the volatility of the underlying stock. So it’ll vary from stock to stock, and that will also change over time. But as a guide on average over an equity market cycle we would expect strike prices to be around 10% above the share price on average across the portfolio where we sell three month options and where we sell one month options around 7% above the share price at the time of trading. Now we don’t cap all of the portfolio, only around 50 to 70% of the portfolio will be overwritten at any one time, so the cap in effect from those strike prices is only applied on that portion of the fund. MIKE HAMMOND: You’ve just indicated there that you don’t sell options on all of the underlying stocks within the portfolio, so how do you go about determining which stocks you do sell options on? GEOFF KIRK: That’s why it’s so, we don’t need to overwrite every stock within the portfolio; it’s likely that a significant portion of the portfolio will not be overwritten at any one time. Stocks with the most exciting growth potential that tend to be those that are less liquid or smaller in size would generally fit into that category so that portion won’t be capped at all. And then Chris and I will work together carefully and go through every name in the portfolio to make sure that we’re only overwriting stocks that we’re comfortable to do so at that point in time. What we’re trying to do is to identify any stocks that have the potential for a short-term price spike and if we see that then we would just pull that name out of the overlaid trade. MIKE HAMMOND: And of course one of the things that gets discussed a lot within these types of funds is as soon as you start mentioning derivatives and options that the perception is that you’re taking a lot more risk. How would you actually respond to that? GEOFF KIRK: Sure, well I would say that cover call options are a very safe use of derivatives. They don’t actually introduce any additional risks over ownership of just the stock by itself; you can’t lose any more money than you can just from investing in the equity alone. What they do is to introduce an opportunity cost of the potential upside you’ve missed out on but we get paid for that in the upfront option premium. Because we only sell options over stocks that we own, any liability that comes due under the option contract is covered by gains that we’ve already made through ownership of the underlying stock, so there’s no leverage involved. And even though I trade these options in what’s called the over the counter market so I’m facing off directly to investment banks I don’t take on any counterparty credit risk. The banks pay me in cash two days after trading and I don’t post them any collateral so I have no exposure to them. MIKE HAMMOND: So given what you’ve just said how would you expect the fund to behave in different market conditions? GEOFF KIRK: OK so in environments where the prices of the shares we own are rising strongly then it’s likely that the Optimum Income Fund would underperform the equivalent equity only portfolio. In environments where the share prices are rising gently, then we’ve got the potential to outperform. When markets are falling it’s likely that we’ll outperform by virtue of the premium that we’ve taken. And when markets are a bit more mixed, it really depends exactly which stock goes in which direction and by how much. But in all of those scenarios, because we’ve exchanged the uncertainty of the potential future growth for the certainty of the upfront cash, the volatility of fund returns will always be lower than the volatility of the equity only equivalent. MIKE HAMMOND: Chris, it might be worth just picking up on the equity portfolio and your current market views and how the portfolio is actually positioned at this present moment in time. CHRIS WHITE: Well the stock market’s very polarised at the moment: some parts of the stock market are cheap and some parts of the stock market are expensive. We’re finding value in income in four areas of the market at the moment: in financials, which includes banks, life assurance and real estate; we find the value in income in consumer discretionary, in the oil sector and in support services. So they’re the areas where we have most of our assets where you’d find us overweight. And on the underweight side we think that valuations in areas like consumer staples and utilities are too expensive. We think that some of the quality industrials are too expensive, good businesses but not offering much by way of income for our investors. And finally an area where also we’re underweight is in the overseas earners in the portfolio. So we’ve probably got a bias towards UK names which is where the value in income is in the market and an underweight position in the overseas multinationals where you’re paying a big premium for that overseas exposure. MIKE HAMMOND: Chris, turning to the primary focus of income generation, could you just give us your views on the outlook for dividends within the UK? CHRIS WHITE: Well there’s a lot of negative commentary about the high level of the stock market at the moment. But actually I think the outlook for dividends is quite positive. If you look at the breakdown of the FTSE 100 for example, 70% of the revenues come from outside the UK and 30% of the revenues come from the UK. Now global growth in the global economy is around about 3½% at the moment, so that’s providing quite a lot of support for profits and dividends from companies’ overseas earning streams. And then if you look at the UK, despite Brexit GDP growth looks like it’s going to be positive next year and reasonably positive, you know, over 1%, that’s going to drive earnings and dividend growth for UK domestic earnings. So I think the outlook for dividend growth is good and I think it’s, you can build a portfolio which is full of value, high yield and growing income for 2018. MIKE HAMMOND: Chris, Geoff, thanks very much for your time today, much appreciated. 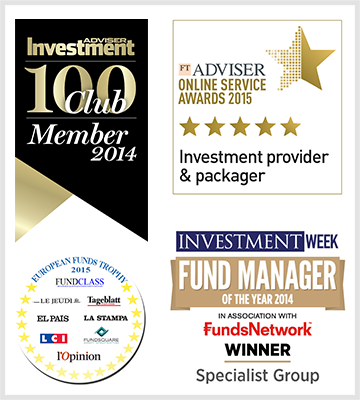 And if you would like any more information on the Premier Optimum Income Fund please contact us on the details shown. Thank you.